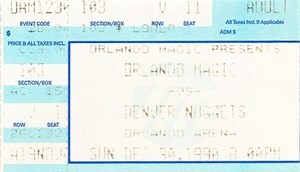 Very rare original ticket stub from the Dec. 30, 1990 Orlando Magic vs. Denver Nuggets game in which point guard Scott Skiles set the NBA single-game assist record (30) in a 155-116 rout. His record still stands. Has a few moderate creases, otherwise perfect. 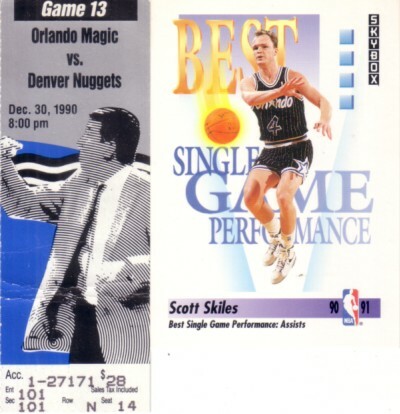 SkyBox basketball card commemorating the feat is included. ONLY ONE IN THIS CONDITION AVAILABLE FOR SALE.